Our CSU Nav staff studied these three books this semester and this is my review of them, hoping to summarize everything onto one sheet of paper. Whether you have any desire to know more about these books or not (you should because they are very important! ), you have to understand the difference between the Old Covenant and New Covenant and their relationship if you will ever understand the Bible. 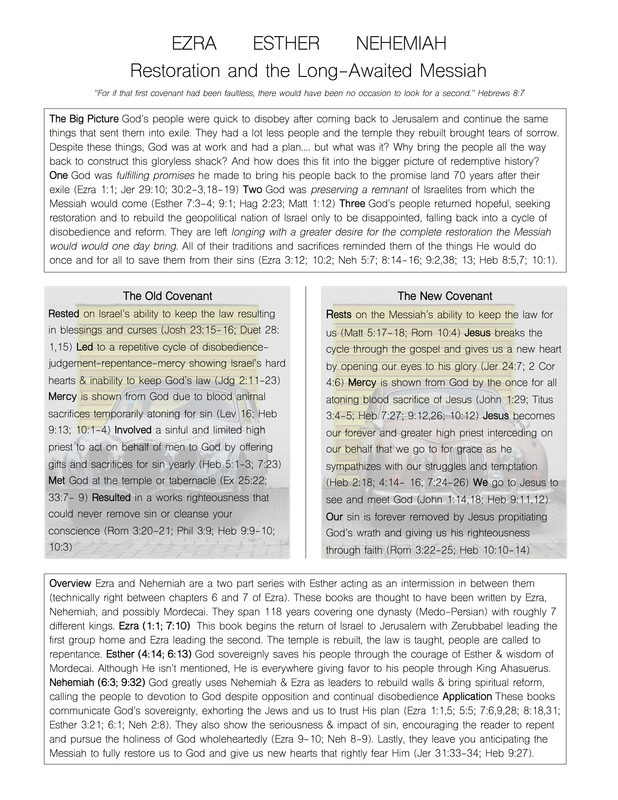 I tried to give a big picture look at both of those covenants. Hopefully this better helps you see what Jesus came to do and why many things in the old testament don’t apply to us as believers today. There is a popular critique these days that christians are hypocrites because they don’t obey all of the Old Testament laws and therefore are picking and choosing what to obey. I hope this helps them see that just isn’t true, that christians are not picking and choosing but rather are trusting in Christ who is, “the end of the law for righteousness to everyone who believes” as Paul says in Romans 10:4.